I Am, I Am, I Am: Seventeen Brushes With Death is a memoir with a difference. Told in fragments, moving back and forward through time, it describes the months I spent in hospital after contracting encephalitis at the age of eight. It relates a teenage moment of madness by the sea, an encounter with a disturbed man on a mountainside, and a severe illness in rural China. It purports to be about death but is actually about life: how we carry on, how we live in the face of challenges and obstacles, how we must make the most of the time we are given. It’s also about the human need for narrative, that atavistic urge to distill experience into story as a means to explain the unexplainable to ourselves. It’s a book I never thought I’d write. I’ve always been so wedded to the form of fiction and never planned to write a memoir. But this somehow demanded to be written. I Am, I Am, I Am is a response to living with my daughter’s life-threatening medical condition. How does a parent absorb and explain the near-death experiences suffered by a young child? How best to reassure them, make them feel safe? The only way I have found to do this is to tell my daughter stories, to transpose what has happened to her into narrative. Only then can she comprehend the illnesses, the threat, the pain. I wrote I Am, I Am, I Am to confront the brushes with death that we all have — and to help my daughter feel less alone. So hard to pick just one. I loved all of Tove Jansson’s Moomin books. And The Secret Garden and Lavinia Derwent’s Sula series. I ask myself that question every day. Am I a writer? Should I be? How good is what I’m producing? In what way could it be better? I can’t ever imagine a moment when I think, yes, I’ve arrived, I am a writer. It would probably be the moment I stop. I think self-doubt and self-questioning are an integral part of the job: you need that critical edge to edit yourself, to improve and hone and craft what you’ve done. Perhaps indulgently, I have two desks. One is covered in paper and mess and unanswered letters and — crucially — a desktop computer connected to email and the Internet. This is where I do my admin, answer emails, and make calls. My other desk is empty as a tundra and has a laptop on it — nothing else, except perhaps a pen and notebook. This is where I write. My laptop has no connectivity, no distractions, nothing to pull my attention away from the work. Punctuation, spelling, and the specificity of semantics. I can be a massive pain in the neck about all these things: just ask my kids. Thrillingly, I once met a woman who told me that she had made a fabric wallhanging inspired by one of my novels. She said she’d send it to me when she was finished. I’m still waiting. I sometimes sing to my cat. He is, I should point out in my defence, a highly intelligent feline with, I believe, a musical sense. My teenaged son does not agree. I’m a committed Molly Keane fan. No one else writes with such grace, incisive wit, and biting insight. Start with Good Behavior, then try Loving and Giving. If you’re hooked — which you will be — there are many more to read. Sea urchins, mid-century Scandinavian glass, rescue animals, sneakers, vintage silk scarves. Maybe I’ve had a string of boring and normal jobs, but I can’t think of one. I was a chambermaid for a while, which was a mixture of backbreaking, fascinating, and repetitively dull. So many. Haworth Parsonage in Yorkshire is perhaps my favorite: everyone should go. It’s an incredible museum and everyone who works there is a passionate devotee of the Brontës. It’s possible to stay nearby in a B&B, in the very room that inspired the Cathy and Heathcliff ghost scene. You can sleep in the box-bed, next to the window where Emily imagined the little child ghost reaching in. Terrifying and moving, all at the same time. Starting something new. Being in the middle of something. Finishing something. Publishing something. It’s all fairly terrifying: take your pick. Assuming it was posthumous, I think I’d have to go with She Was, She Was, She Was: Eighteen Brushes With Death. I read these lines for the first time when I was 13, in an English lesson, and it felt like an electric shock. When I looked up from the page, the world felt different. The whole poem is of course perfect. Not a word out of place, not an image unclear. I keep a copy of it on my wall. Describe a particularly memorable dream. I had a dream the other night that I needed to buy bread, but all the loaves in the shop were too big to hold. I was struggling under the weight of one when I woke up. No idea what that means. The widespread verbal tic of inserting grammatically unnecessary "likes" into sentences. It sets my teeth on edge. I’m very fierce with my kids about it — perhaps too fierce. My five-year-old daughter asked me recently, "Is it OK to use 'like' if I’m saying 'I like dragons?'" I felt like the world’s worst mother. On another note, I have a problem with people using "antique" as a verb, as in "we went antiquing." It’s a deal-breaker for me. I’m not sure if it’s a phobia, but I am terrible with heights. I recently had to crawl over an aqueduct with my eyes closed because the sight of the drop below was unbearable to me. Not my most dignified moment. I like chocolate. End of. "Keep going." Said to me by a writing tutor, after I’d shown them 20,000 words of a manuscript. Why, yes, I would, thank you very much. An account of the ill-health that has dogged and defined and altered her life, this book is written with her trademark empathy, insight, and lexical precision. Didion is the mistress of memoir and this one is my favorite. The title describes the belief that we all, at times, entertain: that if we do the right thing, at the right time, we can somehow avert bad luck. Roth remembers the life of his father, as he is diagnosed with an inoperable brain tumor. Written with wisdom, grief, and poise. Several dysfunctional generations and their effects on the young Sage are laid out here, in clear and compelling prose. Patchett’s books are compulsory reading for me. I would read a shopping list, if she wrote it. This is a series of nonchronological essays taken from life. The verve and daring and fury of this book take your breath away. This is an interesting study of anger and humor. Auslander can make you simultaneously laugh and gasp in shock: quite a skill. Born in Northern Ireland in 1972, Maggie O'Farrell grew up in Wales and Scotland and now lives in London. She has worked as a waitress, chambermaid, bike messenger, teacher, arts administrator, and journalist in Hong Kong and London, and as the deputy literary editor of The Independent on Sunday. 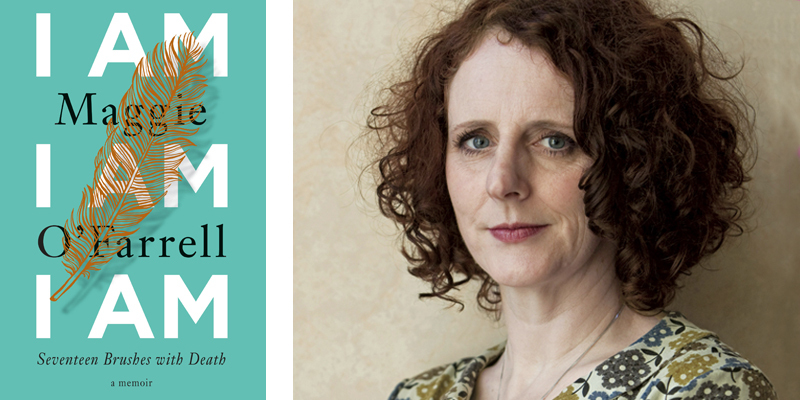 Her debut novel, After You’d Gone (2000), won a Betty Trask Award and was followed by My Lover’s Lover (2002), The Distance Between Us (2004), winner of a Somerset Maugham Award, The Vanishing Act of Esme Lennox (2006), The Hand That First Held Mine (2010), winner of the Costa Novel Award, Instructions for a Heatwave (2013), and, most recently, This Must Be the Place (2016). I Am, I Am, I Am is her first memoir.